The content management modules are made specifically with the food service industry needs in mind, making it easy for you to include your menu, business hours, or address. Each web page is composed of sections that can have many types of layouts. You can choose to distribute your content in several columns of varying widths. You can rearrange the sections by drag and drop. 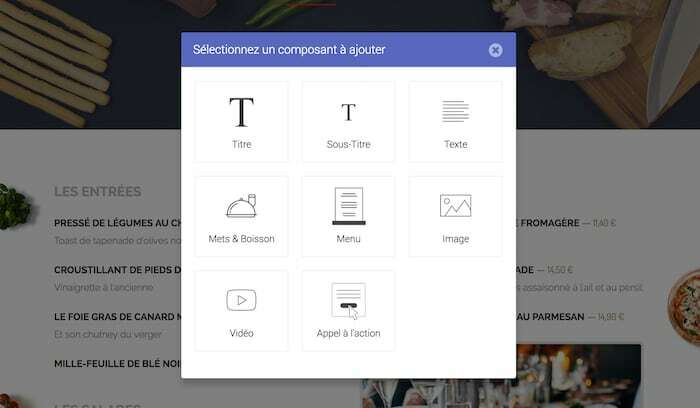 Aux-petits-oignons.fr allows you to modify your sites content quickly, easily, and without any need for technical knowledge. Adding, modifying, and deleting content takes place directly in the site. The modifications are immediately pushed and visible. You can reorganize your content by simply dragging and dropping. Switch two items on your menu or rearrange the photo display—it's like a game. 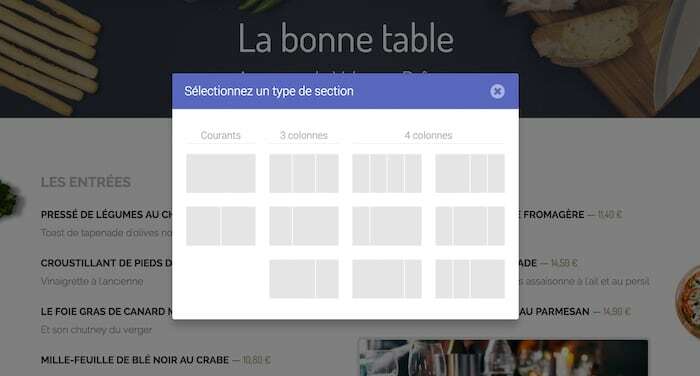 You can insert components within sections and organize them as you like. Within the management interface, directly add your images by dragging them in from your desktop or web browser. By clicking on photos or illustrations on your site, your visitors can see them in full screen, without losing any quality. Once a photo is displayed in full screen, you have the option to go from one photo to another within a gallery. A gallery gathers the set of all images displayed on a page. Your website is visible on search engines (Google, Bing, Yahoo). We do everything we technically can for your site to be well ranked. You have control over the structure of your site, as well as over the metadata associated with each page, such as the title or description. All of your pages have a clean, readable, and easily indexed URL.